Example of pattern in a crisp fabric without the side hem piecing. 2.5 yard of 60” wide fabric. Please clip and mark your desired neckline. This is a place where I make cursory notes on the samples I am working on, the text changes from time to time and sometimes there are grammatical errors that I will try to correct when I see them. If you already own this pattern and had questions about the construction, I hope this helps. This is another really simple pattern to stitch up but it does require some pre planning and conceptual wrangling. I hope this helps. What kind of hem - there are many options for the hem shape and length. Once you learn how the pattern is cut and hangs you will discover many options to play around with. It can be a top, tunic, or dress. If you want a tea length circular or longer you will most likely need to add an extra panel to the sides to extend the length. Depending on which direction (with grain or cross grain) you place the center front and back the garments can be short in the front and back and long on the sides or the reverse. This will make more sense when you start working and I am planning on making different samples. Fabric choice - fabric with drape and body (soft or more open weave) will stretch from the weight of the bias and mold to the figure. In a tighter weave the dress will not elongate as much - it's up to you. Seam Allowances are not included on the inside piece that you remove, I recommend about 3/8" or according to how you would like to finish the edges. Cutting and Layout - 5 yards for tea length with piecing depending. That is 2.5 yards for the body and then another 2.5 yards split in half lengthwise and pieced to each side of the hem. It is best to use fabric that is at least 58" wide, the wider the fabric - the longer the length - but feel free to play and add panels to the hem or not to influence the shape. The shape you see in the center of the single pattern piece acts something like a cookie cutter - you are working with negative space. You will subtract or remove this piece from the center of the fabric. Either trace your size out and place on fabric or remove your size from the larger sheet and lay the large paper piece with cut out removed on the fabric - trace and cut - don't forget to add seam allowance along the interior of the shape. Take a moment to notice which direction of the pattern piece is the front and back and which direction runs the side seams. Feel free to run the direction of the center front/back in either direction - with grain or cross grain. You will notice that this decision effects the length of the garment depending on the width and length of your fabric. 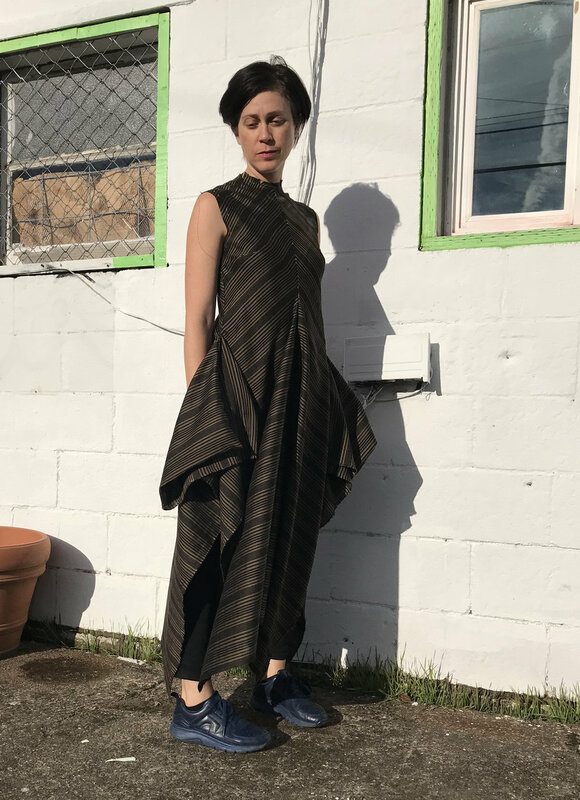 The legacy pattern places the grainline running parallel with the side seams and the center front and back run crossgrain (selvedge to selvedge) making the dress length to be determined by the width of the fabric. 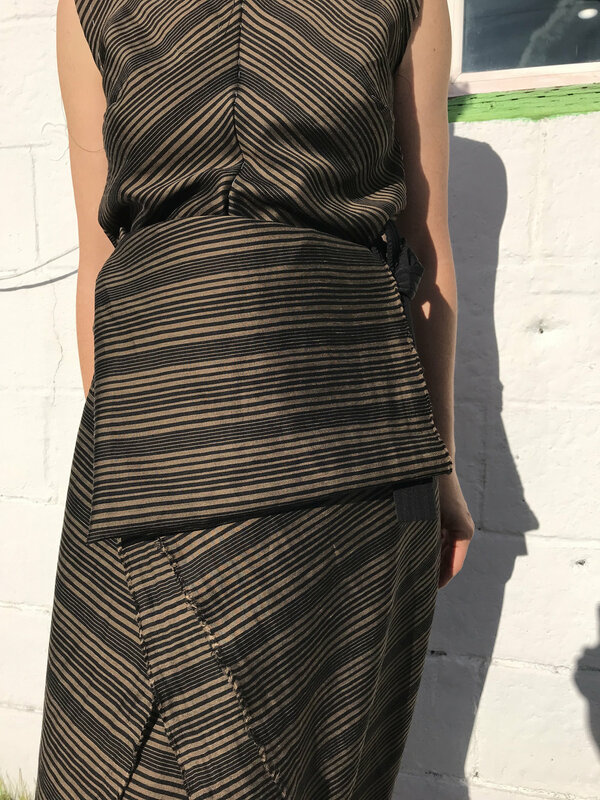 For the longer circular hem - I layout the center front and back running parallel with the grainline so the front and back length can be as long as I want or as long as my fabric length. To add length on the sides - stitch a panel along each of the selvedge lengths. So if you cut the dress out of 2.5 yards, take another 2.5 yards, cut this down the center on grain creating two lengthwise halves, then stitch each half onto the side hems or selvedges. Alternately, If you cut out the dress in 3 yards, you will need another 3 yards halved to extend the side length. It is recommended to thread baste each seam line and baste seams together along with darts before beginning. There is only a small amount of seaming so this step will go by quicker than you think. Hang the dress for about a week, in this process it should be expected that the darts will shift down as the dress elongates allowing for a molding effect to the body. Therefore expect that the darts will need to be adjusted. Remember that bust darts (depending on who you ask) should end no closer than .5" from the apex of the bust.